Are perfect attendance awards stupid? Harper is home sick today from Kindergarten. This is her first ever missed day of school. She had a good run . . . for a month. Looks like she won’t be the Cal Ripken of Royerton elementary. Anyhow, all of this got me thinking about awards for perfect attendance. b) they were sick, likely multiple times, and exposed the other students and their co-workers to their germs. Never being sick is highly unlikely so that means awarding perfect attendance is encouraging the spread of germs in schools and the work place. And that seems kind of stupid, doesn’t it? In 1970 four Kent State students were shot to death and nine more were wounded as the National Guard turned their guns on protestors. 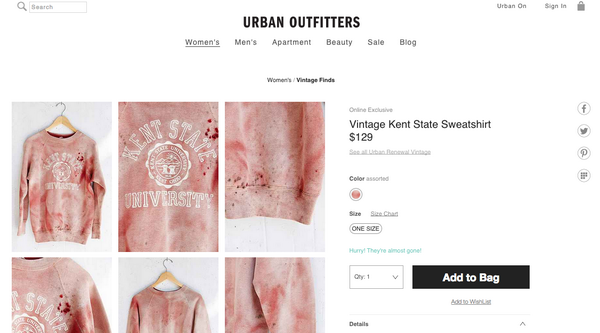 Forty-four years later, Urban Outfitters is monetizing the tragedy by selling a blood-stained hoodie complete with bullet holes. 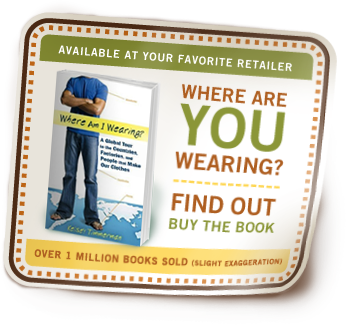 Of course Urban Outfitters says the red stains and holes were simply an accident. Sure, an accident that the company photographed and posted on its site for sale for $125. You can read about the controversy on Mashable and BuzzFeed so I’m not going to recount everything that has been said, but I want to make two points.